An anti-ketamine molecularly imprinted polymer (MIP) was synthesized and used as the sorbent in a solid-phase extraction protocol to isolate ketamine and norketamine from human hair extracts prior to LC-MS/MS analysis. Under optimised conditions, the MIP was capable of selectively rebinding ketamine, a licensed anaesthetic that is widely misused as a recreational drug, with an apparent binding capacity of 0.13 μg ketamine per mg polymer. The limit of detection (LOD) and lower limit of quantification (LLOQ) for both ketamine and norketamine were 0.1 ng/mg hair and 0.2 ng/mg hair, respectively, when 10 mg hair were analysed. The method was linear from 0.1 to 10 ng/mg hair, with correlation coefficients (R 2) of better than 0.99 for both ketamine and norketamine. Recoveries from hair samples spiked with ketamine and norketamine at a concentration of 50 ng/mg were 86% and 88%, respectively. The method showed good intra- and interday precisions (<5%) for both analytes. Minimal matrix effects were observed during the LC-MS/MS analysis of ketamine (ion suppression −6.8%) and norketamine (ion enhancement +0.2%). 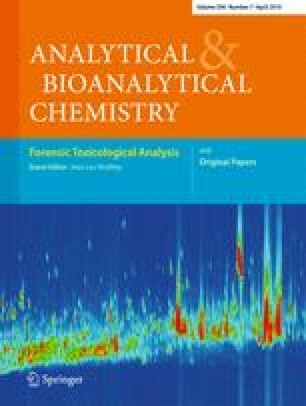 Results for forensic case samples demonstrated that the method successfully detected ketamine and norketamine concentrations in hair samples with analyte concentrations ranging from 0.2 to 5.7 ng/mg and from 0.1 to 1.2 ng/mg, respectively. Illustration of the ketamine-imprinted polymer and its recognition sites. This study was supported by a scholarship from the Department of Public Service and The Ministry of Health, Malaysia.